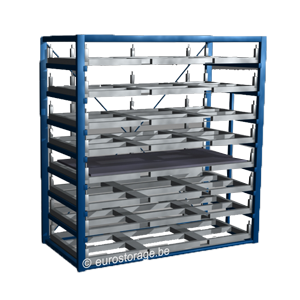 This horizontal metal sheet rack compactly stores your metal sheets and facilitates easy handling with its roll-out drawers. The pivoting doors provide direct access to those metal sheets at all times . . . 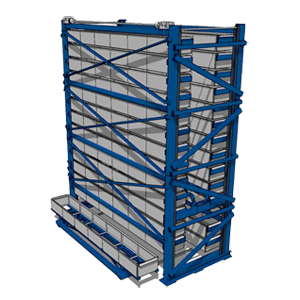 The metal sheet warehouse rack is a compact combination of the metal sheet rack horizontal and the metal sheet forklift rack . . . This drawer boasts direct access to every drawer. It decreases labor time significantly. . . These frame racks are moved manually. They are very compact and offer a great overview of all your metal sheets, stainless steel sheets, aluminum sheets . . . The metal sheet forklift rack consists of cassettes, which are equipped with fork openings. These openings guarantee safe handling with a forklift truck: the forks will never touch the metal sheets directly . . . 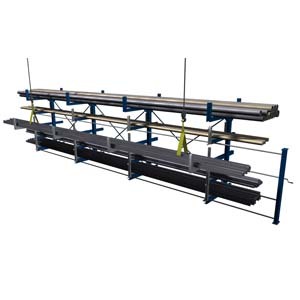 This cantilever with pivoting arms is perfectly suited for storing steel profiles. There are one-sided and two-sided models, which can both be customized extensively . . . 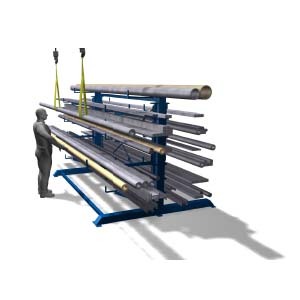 This rack can hold steel profiles of up to 20 meters long, and is equipped with extendable arms. The customer can define the loading capacity and the number of drawers . . . 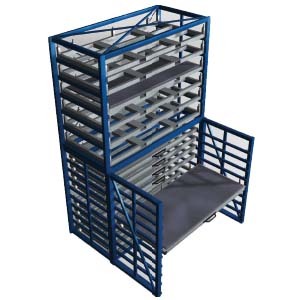 Storage rack with extendable cassettes for complete access to tubes and profiles . . . 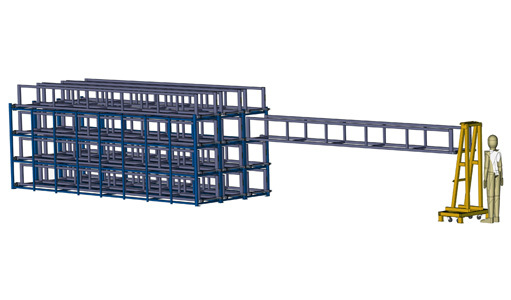 This vertical automated warehouse rack garantees maximum storage capacity by using the available height. Vetical lift for automated sheet retrieval . . . 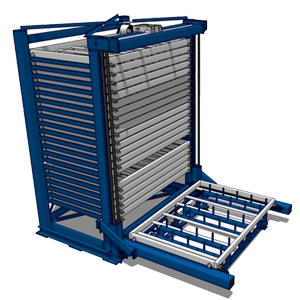 Compact storage of profiles and tubes in the automated sheet tower. 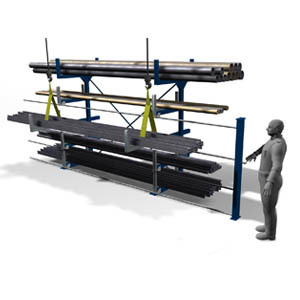 Automatic lift for automated storage and material retrieval . . . 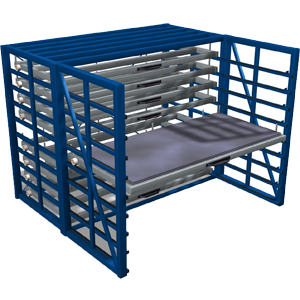 This storage rack consists of closed off automated mobile frames, which will ensure safe and easy handling of your metal sheets . 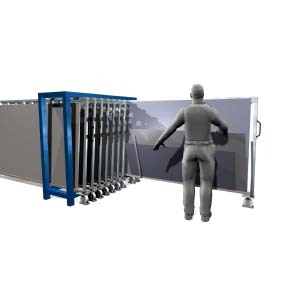 . .
With this rack, you create one handling aisle by moving the mobile frames electronically. This method is perfect for saving space when you want to store a big volume of heavy metal sheets . . . 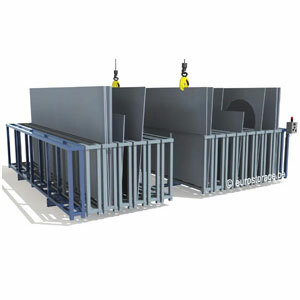 This rack has arms that can be rolled out for the storage of steel profiles up to 20m! load capacity and number of drawers are completely by the customer to choose . . .